"Not just our feet but the wives also! ": Not a lady in sight in this scene. Pope Francis has made known his desire to convert the papacy, but will he leave it there? I can speak only for myself but I'm quite terrified by the Pope's decision to have Cardinal Robert Sarah modify the optional Rite of the washing of feet which forms part of the Holy Thursday liturgy. Is "terror" too strong a word for how I feel about this? No, it is not for the implications of the Popes move are deep and potentially lasting. Permit me to articulate why Catholics who care for the Church and for souls should feel shaken to his very core over this move by Pope Francis. First, the collegiality and the 'synodality' of which we have heard so much. What happened to that? With a quick memo to the head of the CDW, with the flick of a pen and drawing upon that until now, dormant full, supreme power and authority that every Pope should rather fear than admire, like the nuclear button, we see Francis's real intent, which indicates pretty well that for all the talk of 'walking together' at the Synod, such talk serves no real purpose in concrete reality. There is nothing collegial or synodal about this striking at the heart of the Mandatum, this is simply, 'let my will be done'. Peter speaks and lo, it is made manifest. Isn't that what power is all about, eh? No good it being there if you can't use it once in a while, and all the while remaining just 'the humble bishop of Rome'. Second reason for terror. It came from out of nowhere. Nobody suspected. There was no drip feed of Vatican gossip coming out about this. Francis is clearly running a tight ship. The bolt from the blue is psychologically effective. Now he has your attention. Now, you're really on edge.You're thinking, 'what's next'? Yes. That's most likely deliberate. This is a psychological battle. It is also a spiritual one. The law is now at the service of the Pope, not the Pope at the service of the law. Got that message? Yes, now you have. That's why you don't know what is coming next. What has come before his arrival is not safe. If it is sacred, it is sacred only when it has been modified or adapted to the times or made custom to this Pope's interpretation of it. If Pope Francis retired tomorrow and a new Pope was elected and deleted Pope Francis's modification to the Rite would Pope Francis take it on the chin and say 'fair dos'? Almost certainly not. You better believe, it's sacred now but what was sacred to every Pope prior to Francis is no longer sacred for all now. Got that? The fact is that in order to modify the law of the Church in regard to an ancient, if optional, rite so dramatically as to redefine the meaning of the rite, you have to believe that what it was before you amended it was wrong. You, (i.e Pope Francis) had the right way, not the Church of Christ - and illegally - you did your best to do it 'my way' in your ecclesiastical career before you gained the authority to change it to your way. So you change it. What was is not now and what is now is better than what was. What was was less than good. It was deficient. It was deficient even though the Person who performed the rite in the manner in which the Church had done it was the Eternal Word, the Son of God, Our Lord Jesus Christ, who, by the way, never had a single 'escapade' in His Earthly Life. The Church was wrong to faithfully imitate Jesus Christ in performing this rite as He Himself did. Now that I have reformed it, the Church is right. Humble, much? Jesus Christ did not wash the feet of any persons but male and as it happens, in His action, they were all ordained. They were His Apostles. Pope Francis washes the feet of ladies, men and muslims. Who has the 'full meaning' of the rite? Jesus Christ and His Church who imitated Him or Francis? Now, after 2000 years we know the answer and it is to be inserted into the Roman Missal. Guess what. The answer is not Jesus Christ and His Church. Personally, I had thought that the Pope's efforts to alter the culture of the Church was to be achieved through subterfuge, press release and interview, speeches, heavily packed and manipulated Synods and other mediums. Let's dispense with that now. No reason here for false optimism. The Supreme Lawgiver has arrived. The annulments train-crash that has canon lawyers and anyone concerned about the safeguarding of the sanctity of Catholic marriage deeply worried should have served as a warning to those who thought the Pope was just going to be a 'media marvel' who was to be unconcerned about law, who would simply flout it himself, preach vague homilies every day and hope others would come along for the ride. Let's dispense with that from this week. The law is (or was) an impediment to what the Pope wishes to achieve in terms of a 'deep impact' on the Catholic Church. This is the start, and he, among a few trusted confidants, knows what is next. So you see why priests might feel a sense of terror. It is not so much what the Pope has done that is terrifying...it's WHAT he has done! It isn't the Rite itself. It's the RITE! Black can become white. White can become black. A rite with at least two sacred meanings, by use of law intimating that Francis now reveals the 'full significance' of the Rite, becomes, conversely, a Rite with a restricted, partially invented significance which was, as far as was hitherto appreciated, not intended by the Lord of Heaven and Earth. The Rite was about humble service of the priest to people, standing Alter Christus, but it was not about inclusivity. Let's consider another rite over which there remains division in the Church and you tell me if this is completely outlandish. What about the Sacred Rite the Mass? For instance, Jesus Christ clearly intended that in saying 'This is My Body...This is My Blood...' He was giving Himself as heavenly food for the Faithful, even at the first Mass at the Last Supper. The Church understands that every Mass is not simply, only a 'gathering of Christians in community' but also the re-presentation of the Most Holy Sacrifice of Calvary and that the bread and the wine become the Body and Blood of Our Lord. 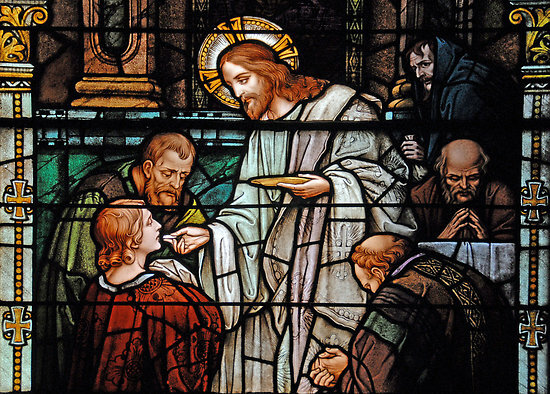 The Mandatum isn't simply, only a humble act of loving service on behalf of Christ to sinful man. It is also symbolic of His intimacy with His (male) Pope and His (male) Bishops. It isn't either/or, it is both/and. Likewise the Mass isn't only a Sacrifice. It is also a Eucharistic meal. A Banquet. But what if today or in future a Pope should come along who thinks that the Holy Mass is simply a community meal, simply the Lord's supper, rather than the Most Adorable Sacrifice of Calvary made truly, ineffably present in a bloodless manner in every place Mass is celebrated around the entire world? The Church was wrong to faithfully imitate Jesus Christ in performing this rite. If just one action in imitation of Christ can be 'improved' following a period of reflection after which it was decided that it was deficient, then another can. What might these others be? The words of Consecration? The Rite of Confession to be changed to simply a counselling session? The rite of Baptism to a new formula? For these reasons, I am deeply concerned about the change to the Mandatum. Fidelity to what Christ did, in one fell swoop, at least in the Novus Ordo, gone, just like that. Call me a 'conservative' if you like, but that's just scary. Ah yes, the final reason it is scary: Because Francis, through homilies, statements etc is communicating to the Faithful that such 'surprises' as this, otherwise known as shocks from the earthquake that is this papacy, are coming from the God Himself, in contradiction to what has already been done by Christ Himself. Fr Hunwicke has a post on the modification to the rite here. Postscript: I know I sound like a hysterical woman (no offence, ladies) but by the time I've calmed down, dear, I expect some other bombshell to be released. After all, as a commenter notes, we are promised monthly 'gestures' during the Year of Mercy. Was this one of them? Others more knowledgeable than I have pointed out that the Office of the Mandatum/ foot washing only became part of the liturgy of the Maundy Thursday mass of the Lord's Supper following the Holy Week reforms of 1955. Previously it had been celebrated after the mass. You or I may not be pleased but it is certainly well within the competence of the holy father to modify the rules surrounding it. In the Gospel we hear our Lord say "you must wash each others feet". This message is not compromised by the change to the rubrics. I don't see why this was such a surprise, nor does it seem to be changing much of anything other than the rubric. First, we knew the pope himself was washing the feet of non-males, non-Christians, now and in the past, so no surprises there. Second, other priests and bishops have been doing this for decades, so what exactly is going to change? The only thing that has changed is the rubric itself. The practice is now enshrined into law; however, it has been entrenched for many years. This is exactly what happened with Communion in the Hand, altar girls, standing for Holy Communion, laypeople distributing Holy Communion, et cetera, et cetera. This is just more of the same. Perhaps this affects younger Catholics more deeply because they never experienced firsthand what it is like to see things like this done by popes, but for those of us who are older, we have become accustomed to seeing them for half a century. Surely doesn't make it right, but some of us are no longer surprised by such things. I lost my surprise decades ago. I think there are a good many other things on the way. Hold on tight! Yes I can see your point, Laurence, and I entirely agree with you about the dire threat of a unilateral papal alteration to the Mandatum. But the rubric was already being breached worldwide, not only by Francis but by Bishops' Conferences (USCCB for example). The Mandatum is not the Mass. This one he knew he could get away with - as he did before he was elected Pope - and Cardinal Sarah has even phrased it in such a way that by choosing outside the 'people of God' for the 'washees', the Pope will himself be breaching his own rubric. That will not go unremarked. He knows he cannot risk interpretative or concrete alterations to the Rite (to the red or the black) without provoking the opposition of the CDW and (this time) of about half the Catholics of the world. And that's just the Novus Ordo. None of this affects the Traditional Latin Rite, which thanks to the foresight of Benedict XVI remains preserved in the precise condition of 1962. It wasn't long ago that Frank indicated he was planning to "surprise" us once a month throughout the Year of Mercy. So I guess the Mandatum was January's surprise and we should expect something else next month. I wouldn't be at all surprised if each one of his surprises surpasses the last in terms of the magnitude of the surprise it induces. As a pastor I have not done the washing of the feet because even with just men it becomes an unnecessary diversion from the more important commemoration of the Lord's gift of the priesthood and His Body and Blood in the Eucharist. I intend to continue to exercise the option to opt out. It is my hope that many brothers with resist the pressure to placate this politically charged and liturgically awkward gesture and stick to the Holy Thursday liturgy which is already rich enough without it. Bones, you have grasped, not only the significance of Bergoglio changing the rule regarding the Washing of the Feet ritual of Holy Thursday, but also the terrible reality of where he is taking the Catholic Church. The day is coming when he will start tampering with the essence of the Mass itself and that day is not far off at all. He intends to wring out all supernatural content from the Mass. He becomes bolder and bolder in his defiance. Whenever I hear him say anything 'orthodox' it signals for me that a sweep of heterodoxy is on the horizon. He reminds me of the Mad Hatter from Alice in Wonderland. Keep writing, Bones, because you are naming where all this is going. Prayer and deepening intimacy with Christ is the only answer, as well as complete obedience to the Mother of God. Pray especially for priests and bishops for whom it will be hardest to endure. Perhaps he'd like to convert the papacy to Catholicism when he's got a moment. Synodality is definitely off the menu if it does not deliver what it was designed to deliver. This dynamic of the law now at service of the Pope is exactly the thing that Easterners are afraid of. (Myself being one of them), to what end will it go? If the Pope has absolute power without limit, God help us. Certainly, it's within the Pope's power to change the rubric, the thing about this change is not the change in of itself being the problem, it's the arrogance through which it happened, by repeatingly breaking Liturgical law, both when he had zero authority to change the law, AND when he had the power to change the law. The Pope quite the opposite of what people tend to think is not free per se to do as he wishes. He too is subject to the laws on the books if he does not change them. He is not free to invent things, he is to faithfully pass on what the Faith, and preserve...I would never leave the Barque of Peter, but this Pope sure is making the Orthodox look rather right in some aspects. We have had good, indifferent, and bad Popes. All 266+ of them. How history judges Francis remains to be seen. But what Francis and indeed the last few Popes will have shown is a more realistic appreciation of the Papacy. It has its limitations both managerially and theologically. Managerially it can pronounce, but practise is another matter. Theologically, the Pope is the Keeper of the Keys, of the Truth of the One True Church as expressed in the Magisterium. He has no authority to change that. His remarks always merit consideration but only in so far as they agree with the Teaching of the Church. He has the power of Infallibility, but that applies only when he is speaking with Infallible Intent, expressed as such, and when he is addressing the whole Church on a matter of Faith or Morals. Even then he can only express as Infallible something that is already believed to be so by the Magisterium. So, the Pope's powers are actually very limited and this is what has emerged, surprisingly so, in the post-Vatican II period. "Since I am called to put into practice what I ask of others..." Lord have mercy. Out of the mouth of satan, or Judas, or Arius, or Calvin, or Luther, or Robespierre, or Bergoglio...and always in opposition to Christ. Good news is . . . February is a short month!